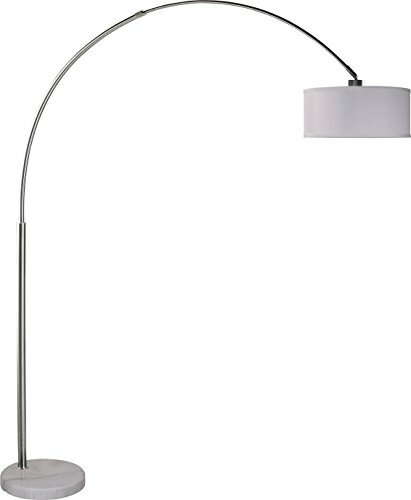 SH Lighting SH-6938WH Steel Adjustable Arching Floor Lamp with White Marble Base, 81" H has a classic design and fits perfectly in any room. This beauty of design carries in its design that well known shape that made this lighting style so popular. It’s beautiful and sturdy marble base makes the perfect elegant and classic component, whereas its sleek metal body takes us to a beautifully round and white fabric shade. 2.Environmental friendly and energy saving, no eye-harming glare. 3.Use the lamp as a gentle nightlight, can creating a romantic atmosphere. 4.Easy to assemble. For safe, please put on the gloves to install the lamp. All Major-Q Products will be covered with Major-Q Warranty. Please buy with confidence.